Ready to win exciting prizes with Julie’s Biscuits? Participate in JULIE’S CHAMPION’S CIRCLE MIX & MATCH CAMPAIGN and win Adidas E-voucher! Julie's is giving away Adidas E-vouchers worth a total of RM80,000! A Mix & Match card can be found in the Julie’s product that has the Julie’s Champion’s Circle Mix & Match sticker on the packaging. If the word on the card is “STAY”, it must match with any of the following words, “STRONG”, “FOCUSED”, “POSITIVE” or “CALM” that can be found in other Julie’s products that have the Julie’s Champion’s Circle Mix & Match sticker on the packaging. Once you have matched the two (2) cards either “STAY STRONG”, “STAY FOCUSED”, “STAY POSITIVE” or “STAY CALM”, you are required to fill up your personal details and answer a simple question stated on the card. 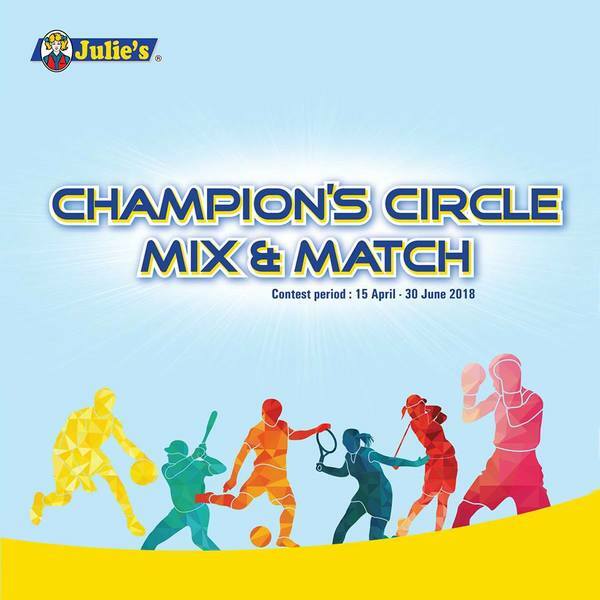 Then snap a picture of the two (2) Julie’s Champion’s Circle Mix & Match cards with your personal details clearly filled up and submit it via “WhatsApp” to 013-8747401.